Chapel Hill is not exactly sea level but it is near enough to sea level that the heat of the summer is oppressive. There is a reason the wealthy used to spend months “summering” in The Mountains. (Some still do!). Elevation cures the illness of hot weather. Because we could not really go outside here in Chapel Hill, Tootie and I went to the mountains for one night. The Blue Ridge Parkway is one of the great bicycle rides in America. However, to spend the night or even eat a meal, a cyclist almost always has to descend about a thousand feet to a town of a much lower altitude. At an elevation of 3500′ Little Switzerland NC is one of the very few spots on the entire 469 mile long Parkway where a bicyclist can stop, spend the night and have dinner right on the Parkway. Neither of us had ever been to Little Switzerland before so we wanted to see what it was like. This would be an up and back one night bike trip. Leaving early, we drove our Prius three and a half hours to the Parkway and then up to an elevation of about 4000 feet, a spot on the Parkway near the town of Linville Falls. We parked in a place that looked reasonably legal to leave our car for twenty-four hours. We unloaded and headed out by bicycle, carrying with us all the luggage we would needed for one night and to have a picnic lunch along the way. Biking the Blue Ridge Parkway in the summer is glorious. Even at this peak season there is not that much car traffic. The weather was sunny but refreshing, with temperatures in the seventies. At lunchtime we could not find a picnic table so we ate while sitting on a guard rail. Two or three hours after starting we pulled into the Switzerland Inn where we had made a reservation. I really like this place. Clean rooms, lovely view, good food, even a decent bar scene. They have lawn games out front. A nice cross section of America was staying there, including a sizable contingent of sixty-something motorcyclists. When there is a view this big everybody just stares at it. We walked around. Dinner that evening was really old school; we split a $ 33.00 chunk of meat entitled “King Cut Prime Rib au jus 14 0z.” Delicious. The next day we bicycled back to the car. The views were stunning. The Parkway went up and down, but the last seven miles were straight uphill from 2700′ to 4000′. Tootie is turning sixty in a few months and she does not bicycle all that much. She was very proud to have completed such a sizable climb! Tootie needed to go to Roaring Gap for a day, so I had her drop me off near there on the Blue Ridge Parkway. This is in northwestern North Carolina, about twenty miles south of Galax, Virginia. My plan was to bicycle down the Parkway to Boone, spend the night, then come back the next day where she could pick me up. Tootie and I shared a picnic lunch in one of the Parkway picnic tables before I set off. Boone was almost fifty miles to the southwest. It is a beautiful highway. The Blue Ridge Parkway was conceived and built mostly in the nineteen thirties at a time when people really wanted to take car rides for pleasure. The automobile vacation was a new form of escape from the confines of regular life. Maintained as a linear National Park, this highway remains an American treasure, built specifically to have great views. People have asked me “do you feel safe bicycling on such a narrow road?” The answer is yes. Even on a summer Sunday afternoon there was not much traffic. By my vehicle count there were more motorcycles than cars. Of the cars I saw, a much larger percentage than normal were convertibles, or some classic older car. It is now mostly motorcyclists and bicyclists that still take trips just for the pleasure of the ride. Maybe modern Americans spend so much time in their cars that taking a beautiful slow car ride does not have as much attraction as it used to. The other attraction of this trip was altitude. The whole ride would be at over three thousand feet in elevation. Taking a bike ride anywhere else on the East Coast during late July would be suffocating. Temperatures here were comfortable the whole time. The bike riding, while pleasant, was tiring, always going up or down. Compared to normal highways there is almost nowhere to stop and get a drink or something to eat. It did feel sometimes like we were up in the clouds. Eventually the clouds opened up and I got wet. There being nowhere to seek cover, I just soldiered on. Boone is some distance from the Parkway so I rode the last ten miles on US421. There was a full size shoulder lane so it felt quite safe, but obviously biking this section did not have the intimacy of the Parkway. The mountains had taken their toll on my legs; I was ready to stop. I know something of Boone because my son Jack went to Appalachian State for four years and graduated in 2012. For the past month I have been following the weather at various places all over the East Coast, looking for somewhere to bike that is not blindingly hot. Boone seemed to be cooler than even some places in New England. A Wikipedia search confirms this. The average high temperature in Boone in July is 79, while the average high temperature in Burlington, Vermont in July is 81. I learn that at 3330 feet, Boone is the highest elevation town (with a of population over 10,000) on the East Coast. Boone is significantly higher elevation, and cooler, than other mountain cities like Asheville. Culturally, Boone is a great place. It has the cosmopolitan nature of a college town and the scruffy ex-hippie vibe of a small Asheville. Several famous musicians have come from this area. The Appalachian State campus is right downtown with its almost twenty thousand students. School was out for summer break but some young locals look like they came out of hipster central casting. There were also other people roaring around in jacked up pickup trucks. But the North Carolina Department of Transportation has insured that any growth beyond the small older downtown core is completely car-centered, and frankly unattractive. Boone has grown tremendously in the past few years and it would be so much better if the newer areas were as pedestrian friendly as the small downtown area around the University. I realize how complicated these issues are. There is effectively no public transportation to the town of Boone from elsewhere in North Carolina. Everybody is going to drive get here. The town is built around steep slopes. How does Boone prevent perpetual traffic gridlock without making much of Boone a strip mall wasteland stuck up in the mountains? Over time the NCDOT chose the strip mall route. North Carolina state law acts like the NCDOT does not do local zoning, but it effectively does. As US421 comes into town, it widens even further. The designers make themselves feel good by putting a bike lane and sidewalk along this monstrosity. (The other side of town, near the Walmart, where US421 goes towards Blowing Rock, is even more hideous.) Every North Carolina town, and indeed most American towns have this same problem. But up here in the mountains it felt more of an affront to see chain motels lining a wide highway. As you near the university and downtown it reduces to “just” four or five lanes. Once downtown the town has a reasonable human scale. There are lots of chain motels on the highway, but no motel or hotel in the core downtown. At about six o’clock I found a downtown bar on Yelp and stopped for a beer to ponder the situation. Eventually I booked a room at a Sleep Inn a mile away from downtown. I biked back to the place, checked in, took a shower, and collapsed into the bed. After chilling for a spell I got back on the bike and went downtown to eat. I ate outdoors at a place called the Hob Nob Farm Cafe. It tries to be simultaneously Mexican, Italian, Indian, and maybe a couple other ethnicities. I applaud their ambition but the ravioli and meatloaf felt a little heavy, even after having biked fifty miles in the mountains. The next morning I rode back down US421 to the Parkway. After turning onto the Parkway, the first three miles were continuously uphill. The views were terrific. My legs still felt sore from the previous day, so I decided after about twenty miles to ride “off” the mountain. Tootie could pick me up closer to sea level. I could go downhill. Near the mountain settlement of Obids I turned right off the Parkway onto NC Route 16. There was a long downhill from here. Even after a couple miles at about forty miles an hour, there was still more to come. When you got off the Parkway you could see a less sanitized view of people’s lives in this area. I stopped at a gas station and got a cold Starbucks Frappuccino. However, after all these years I still have never eaten any of these types of snacks. As I rode further I talked with Tootie on the phone. She would meet me near the main highway in Wilkesboro. 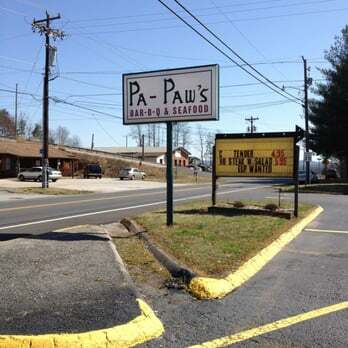 I stumbled onto Pa-Paws Bar-B-Que & Seafood just as I was getting into North Wilkesboro. I did not want to keep Tootie waiting, so I bought a barbecue sandwich, with slaw, to go. It was a very white working class crowd. I still wish I would have photographed the four pot-bellied sheriff deputies as they were leaving; all four in civilian clothes but each sporting a badge and a pistol on his belt. They all silently watched me unlock my bicycle. I struggled on the last few miles. At the highway exit where I would meet Tootie, I sat under a tree and had lunch. This region was until recently a world center of furniture manufacturing. A lot of factories were built here to take advantage of abundant water power. With my bike in the trunk, I had driven the Honda out here the day before so I could play golf with my son Sam who lives in nearby Asheville. I decided to add this one and a half day bike ride to the trip. While Hickory is the largest town in this area, I actually did not bike through much of Hickory. I guess I will have to do that another trip. I started instead in Hildebran, about eight miles west of Hickory. There is a depressed looking Food Lion and Family Dollar across from a closed textile mill in Hildebran. I parked the Honda in the large lot and pulled my bike out of the back. I have been lazy and deferred a lot of maintenance on the Surly Long Haul Trucker. The rear tire still held air the whole trip, but it had chunks of rubber coming off. My first destination was the town of Lenoir, about twenty miles west, where I planned to eat lunch. The road to Lenoir passed through a series of small factory towns, some more vibrant looking than others. While there are clearly town limits, the people around here seem to live mostly spread out along the country roads. Does this qualify as Country Modernism? Rhodhiss was the first town after Hildebran, just a few miles down the road, next to a dam on the Catawba River. A web search shows that an Italian leather distributor does exist at this address, but the mill looked pretty empty on this Thursday morning. Mill houses that probably used to look alike were scattered on the steep hills of the ridge above the river. Rhodhiss pretty much blends into Granite Falls, which has an attractive downtown, with empty and partially empty factories on both sides of the road. The town should be proud to still have an operational video store. and a relatively new brewery business. In the next ten miles to Lenoir I passed literally dozens of factory buildings, most closed or nearly closed. Others were very much in business, including this clearly busy dumpster factory. Just before Lenoir I passed this place, but I was not quite ready to stop and eat. Lenoir is a pretty town on a hill. In one of the nicer neighborhoods near downtown, I passed two nicely fixed up arts and crafts houses. At lunchtime on a Thursday, everybody seemed to be eating in this place. I got corn soup and half a reuben sandwich. The afternoon ride after lunch was to be the twenty or so miles to Morganton. This ride turned out to be more rural and peaceful than the morning ride, it weaved through a mix of woods and farmland. I passed a lot of religious enterprises on this trip. My theory of American faith holds that one reason Americans are so religious is that religion is so customer friendly; new churches are constantly starting up. America must be the world center of religious entrepreneurialism. If you get bored with your church there is always another one around the bend. Here are two churches I saw on this trip that have been started out of a trailer. This one takes a scripture quote and uses it to sound really judgemental. I cruised into downtown Morganton. I had never been to Morganton before. The only connection I had to the place was over ten years ago when I had an employee who talked about Morganton a lot. She was from Raleigh but her boyfriend was from Morganton. She repeatedly badmouthed him as being unintelligent. Like her boyfriend, she was a UNC graduate. She claimed that her boyfriend only got into UNC because he was from Morganton. (It is common knowledge that students from more rural areas enjoy admissions preferences to places like UNC) I met him once, he was in graduate school at UNC. He seemed not only intelligent but a nice guy. They broke up eventually; she is now married to someone else. I found a coffee house and drank a decaf cafe au lait while I considered my lodging options. Google Maps confirmed that there are no motels or hotels or b&bs anywhere in the actual town of Morganton. Everything is out by I-40. But Morganton does seem to have a vibrant downtown, with several nice sounding restaurants. I ended up staying at the closest motel, a Days Inn two miles away down a steep hill next to the Interstate. I chilled for a while in the motel, reading The New Yorker on my Kindle, glad to have gotten there before the thunderstorms began. The rain had stopped by the time I was ready to go eat dinner. I am a snob. I admit it. Right two doors down from my motel was a perfectly acceptable Village Inn Pizza Parlor. But I wanted to go to the tonier places in downtown Morganton. So I pedaled two miles back up the hill to downtown, passing the state psychiatric hospital. The Wisteria Southern Gastropub is a really nice place. I sat at the bar and ate $22.00 fried catfish, preceded by asparagus soup and cornbread ears, followed by strawberry cobbler. It was all delicious. The bartender had recently moved to Morganton from Madison, Wisconsin, of all places. His wife is a psychiatrist who got a job at the state hospital. It did feel somehow very elitist, especially after seeing struggling North Carolinians all day who would have been eating at the Village Inn, if they ate out at all. I passed the Village Inn when I rode the bike back down the hill in the dark. The next morning I rode the eighteen miles of US-70 back to Hildebran. This is the old road that parallels I-40. There are a lot of empty buildings. On the outskirts of Morganton I passed two pieces of empty modernism. Plus a cool looking bank and drug store in Valdese. There were gas stations of old. And a drive-in in Valdese. All along this highway was evidence that people were trying to sell something, trying to start a business, even if it was just a garage sale, or some kind of second-hand store in an otherwise abandoned looking building. I got back to the car in Hildebran before lunchtime.